Manufactured in France from Circa 1913 until 1940. The problem with this beautiful view camera, it is that it is very difficult to associate it with a definite brand. It is well present in the Lorillon catalogue of 1927, but it is found presents, with the same illustration in a large number of catalogues of various brands between 1913 and 1940! Lorillon is not thus inevitably the manufacturer, but only one retailer of this view camera. To find it, click here. 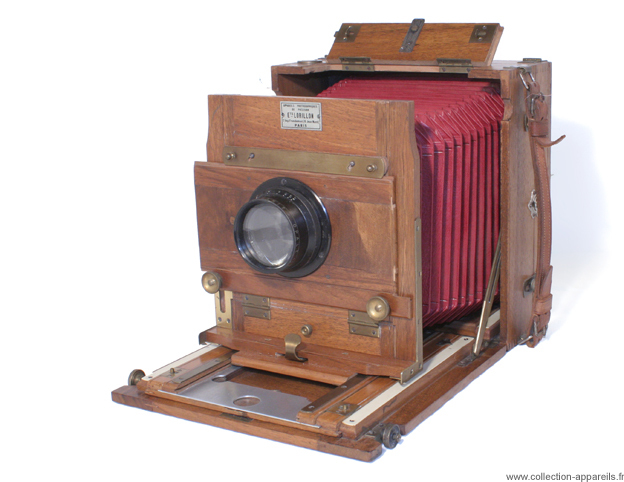 Lorillon calls it “square Folding camera N°3 “Triplex”. That of this page is with the format 13 x 18, but it also exists in 9 x 12 and 10 x 15. Manufactured in walnut, it was also available in sheathed mahogany and tropicalized version all mahogany. The terms of the catalogue Lorillon 1927 define it as having a very large off-centring, height and width. The back rocks also vertically and horizontally. The carriage holder comes down so that it is not visible in the event of use of a wide-angle lens. The illustration used during almost 30 years in the catalogues presents it always in the position of use of a short focal distance. Its lens is a Boyer Opale of 4.5.210 bearing the n°119448. One should decree a posthumous medal with the engraver who around 1913 was to be far from suspecting that its drawing would be used a so long time.